I finished "Stable Cat". The Derwent Drawing pencils have certainly encouraged me to do more animal drawing. We will have to visit the Kentucky Horse Park sometime during the summer when more horses are available on display and take more photos. For a change of pace I did a quick winter evening landscape (16 x 20 inches) in pastels on gray charcoal paper. Winter scenes do attract me. This particular drawing was a combination of two photos I have taken and modified. It is a rare photo that can be used just as it is! The stable cat drawing is an exception, mostly that was a matter of cropping the original photograph. My first major winter drawing in now in progress. This scene is along the Root River in Minnesota. More than half of my photographs are taken from a moving car so they are often not of the best quality. However, that is where creative license comes in and pictures are cropped, items moved, deleted or added, colors are altered and much more. In my younger days I did much outdoor drawing and painting, but later time constraints due to employment and then my disability have put an end to that. But none of that experience is never wasted and the sketches and paintings are still available for review. 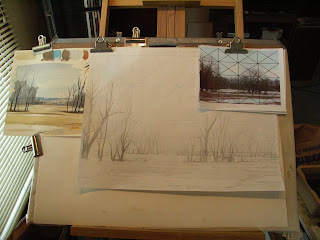 This Root River scene is being done on watercolor paper with watercolor washes for the background. 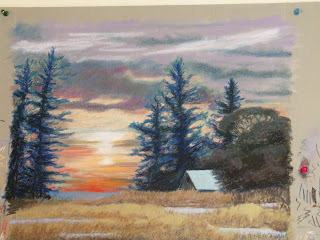 The photo shown here has the sky and background washed in and the foreground snow masked out for the yellow forground to be painted. Just yesterday we drove back to Rockford, IL to get the Wunder Bug at the dealer. A month ago, coming back from our latest trip, we hit a loose spare tire on the interstate and damaged the radiator and transmission on the Wunder Bug. It was taken to the local VW dealer and the insurance agnecy rented a car for us to use. After delays in getting the parts, the Bug was ready and we drove back in the rental and got our car. It was an all day trip in sunny conditions. I took lots of photos from early morning to after sunset. I just reviewed them and excited about the possibilities. My eyes are always bigger than my time and energy available!